There are often accusations that there are no jobs after art schools. We decided to offer a counter argument to this rumor – this is how #MSKPU Career was created – interviews with graduates of the International School of Clothing and Costume Design … who are doing very well on the market. 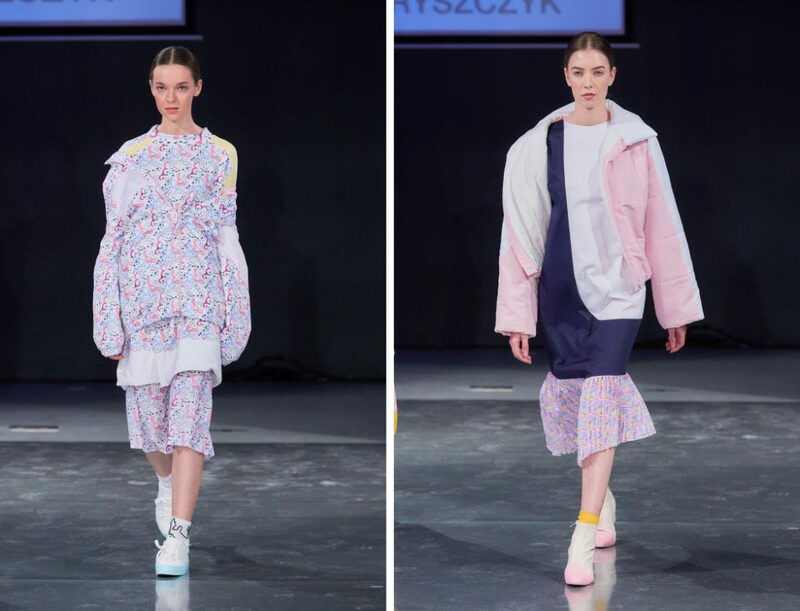 Trochimiuk Agnieszka Jagna graduated from MSKPU with a diploma show of her GIRLSYHOOD collection in March of this year. Two months later she got a job in one of the most top-notch brands in Poland – LOCAL HEROES. Agnieszka, what is the feeling? Absolutely fantastic. It is very humorous that when I last typed “Local Heroes” in the search engine, it popped up that 3/4 years ago I sent my CV and portfolio there. Then it didn’t work out for me. It does not surprise me at all, it was very bad (laughs)! Now it is different – I am more aware of the reality. I know what I have to do and how I have to approach it to make things happen and at the same time be good and have this “something”. Do I feel some sort of … pressure? You know, someone trusted me. It’s a lot. Failure is not an option. This is true. Earlier, however, while you were studying at the MSKPU, you worked at Alkopoligamia. Was working there different from what you expected as a designer? Hmm, here I have a small anecdote. When I came to work in Alkopoligamia, I spent the day filling out production tables and then I heard: you see, that’s how designing in companies looks like. Of course, then they wanted to scare me a little and it was not entirely true. Only that it did not cause fear in me. I already knew about it – the production tables were already processed in the first semester. This is a big plus – the school gives hands on lessons while at the same time, they do not give up creativity. In Alkopoligamia I also had the first, somewhat unpleasant, clash with reality. When the jacket came out of production – my first project from A to Z – it turned out that it was sewn from the wrong fabric. Instead of light blue, gray-blue was used. I made a big deal out of it with the manufacturer (laughs). In the end, we made the print on the jacket to make it look better. In fact, it saved the situation a bit. Work in a company teaches you to react to situations that should not happen at all. However, they do happen and you have to accept it. How did you combine work in Alkopoligamii with learning at MSKPU? I went to MSKPU right away after the Fine Arts High School. I was there all the time in the mode: going to school at 8:00, classes to 15:40, then additional classes from drawing until 18:00. Removed from the day 10 hours at school on a daily basis. I treated it as a passion. It was a teaser in learning new things. When I came to MSKPU and saw the schedule, I was shocked. I thought, “What am I going to do now?” I quickly started looking for additional work. I was an intern, I helped in photo sessions, then there was a job at Alkopoligamia. I did not have a problem in combining school with work, even during the exam session. I slept 8 hours a day. You know, it’s “just” fashion, not cardiac surgery. You really do not have to be stressed out if you love this and you know you want to pursue this career. Everything is possible, and even it goes quite well. Only at the beginning you have to put in effort in order to learn the necessary skills. I was lucky and could already start doing this in high school, but I know that MSKPU shaped me the most. Where did the interest in fashion and art come from? What are you inspired by? Art has always been near and dear to me. My mother is a doctor, my father is an entrepreneur, but my parents took great care to let me and my brother learn about the world. We traveled a lot and visited a lot of museums before I went to high school. For a year, after junior high school, I went to high school. After half a year, I told my parents that it would not work out. I knew I had to change the school because I was suffocating and I knew it was not for me. My mother was optimistic, dad hesitated, in the end they allowed me to make my choice. I normally completed the first year, but I made the decision that I would also go to high school for the first year. As a result I spent 5 years in school. I listened to my peers opinion for half a year that it was the most stupid decision in history. As when they will be in the second year of their studies, I will only finish high school. I’m glad I did not quit. Most of my friends went on to college, which did not interest them. I am very lucky that I do what I love and I can make a living out of it. It’s great. Your collection was very well rated during this year’s graduation show. Tell us about it. My collection is a continuation of the tasks from the 4th semester at MSKPU. The task was to design a collection with its own imprint. I really like making my own prints, because it’s a complex process: you paint on a piece of paper individual splits, scan them, clean them in a graphics program, and assemble them into reports … and it shows up. 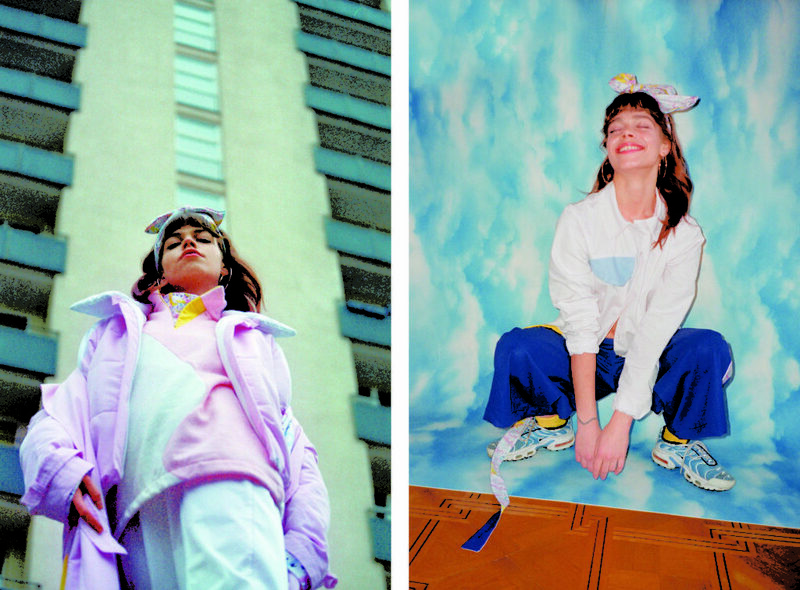 I knew that I wanted to make a collection for girls and be inspired by them. In addition, I really wanted to make a pink, oversize coat with yellow elements – this is the first diploma project. In addition to being inspired by girls, I was also influenced by guys wearing sweats. Out of these two groups came the idea for colors, textures and forms. I remember, more or less in the middle of the semester, I came to Mrs. Magda Floryszczyk (Basics of Dress Design) with the first sewn items. She scared me a bit that this might be difficult to defend. There were two options – either everyone will understand this and there will be a lot of positive feedback, or nobody will understand this … Fortunately, the first took place. The session and video were very important in this collection. It creates a coherent whole. If the session and the video were different, I dare to even say that the collection would be criticized. The photos were taken by a magnificent and uplifting team of photographers Tatiana Pancewicz and Karol Wysmyk. It was completely professional. In turn, the video was purely spontaneous. That idea came to my mind and we went ahead with it. The main character Korenelia Groworek, who is both my sincere friend and model was the star of this session and video. She created the atmosphere. We went to record this the three of us: me, Cornelia and my boyfriend. I was supposed to record, but my boyfriend turned out to be a better camera person. He also invented the camera entry – from the model onto the blocks of flats. For us it was such a creative way to spend the afternoon. We did not plan for it to come out in a specific way however it came out great. I got a lot of accolades. All in all, if I think about it the diploma event is a very spontaneous event. I did not go bonkers over anything – I wanted to make a down jacket, I made it, I wanted a dress I made it as well. However, I did not put pressure on myself. Generally, I try to follow this idea in my life that the less you stress yourself out, the better is the result. The diploma event only confirmed my philosophy: if you do what you should be doing than your will come out on top. I received 5 distinctions: internship in Bizuu, 5.10.15; ZIEŃ distinction; Media patronage Kobieta.pl; offer to cooperate with Svoi MYSIA 3 store. You deserveit! We follow your career on a regular basis. How does a regular day at Local Heros look like? No day is the same which makes the work even more exciting. There are days where I spend half the time searching the internet for inspiration and the next half designing. There are days when I am looking for fabrics, or if I am involved in production. Local Heroes is not a corporation – there are no divisions in the design departments, different sectors: sales or technologists. We operate with a few people and these are really very talented individuals. In small companies, a strong team is the foundation. Who would you recommend MSKPU to? Which classes were your favorite? I reminisce the most about classes in Graphic Design. It is due to the lecturer that I made prints in my diploma collection. I loved working with Mrs. Weronika Pietras. I made substantial progress in design. Although the biggest breakthrough was after the second semester after classes with Mrs. Magda Floryszczyk. Then I understood: Aaaaa, that’s what design is all about! Besides, Magda was my promoter in the diploma collection. It was the best possible choice! Magda is a great person, and a very helpful promoter. I remember when I came with a pair of pants that were badly sewn we discussed at length what can be done with them. In the evening, I got a lot of inspirational links from Magda which shows her full commitment. Then you want to do more because you know it would be foolish to let the person down. When her students are defending their collections, she fights like a lioness for her graduate students! Anyway, it’s enough to look at the fact that five of her graduate students have defended themselves with honors. P.S. Magda, if you read this once again, THANK YOU! I would certainly recommend MSKPU to the HUMBLE students. It really does not work if you have great ideas and you expect them to come to life on their own. It doesn’t make sense to complain about construction or sewing classes while attending them. The fact is that it is not easy for everyone. I assure you however it helps and facilitates my professional life greatly. The same holds to be true for drawing. So what if you draw 1 figure out of 100 correctly? It should be the other way around meaning 1 out of a 100 can be drawn badly. Ambition – I think there are different components to success. Not only at school, but in life in general.